If your taste buds have been mysteriously tingling with the flavor of a sweet, cold, and creamy snack, you may be feeling the force of Ample Hills Creamery from a freezer far, far away. 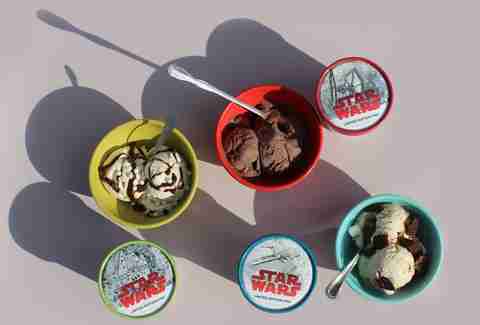 That's because the Brooklyn-based ice cream maker teamed up with Disney and Lucasfilm on a trio of Star Wars-themed flavors in celebration of Friday's release of Star Wars: The Last Jedi, and they're selling pints of all three flavors online. 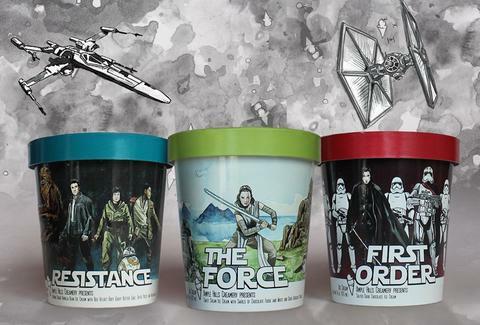 The three limited edition flavors -- each of which comes packed in pints sporting specially illustrated labels -- are inspired by the "heroes, villains, and enduring themes" of the franchise. They include First Order, a salted deep dark chocolate made with cocoa powder, bittersweet chocolate, and a dash of espresso; The Force, featuring sweet cream, swirls of chocolate fudge (the dark side), and white and dark chocolate pearls; and The Resistance, a brown sugar and vanilla bean ice cream with a variety of mix-ins like red velvet ooey gooey butter cake, toffee pieces, and mini-marshmallows. If you're in the New York City area, you can grab 'em at most Ample Hills retail locations, and they'll also be available in the freezer sections of select Whole Foods across the Northeast. You can also order online and have them shipped anywhere nationwide, though there is a slight catch: you have to order all three. However, as a bonus, they come delivered in a specially designed box complete with a punch-out X-Wing fighter.